Heat oven to 375°F. Spray 15x10-inch pan with sides with cooking spray. Place fish sticks in single layer in pan. Bake 10 minutes, turning once. Meanwhile, separate dough into 8 triangles. In shallow bowl, place taco seasoning mix. Lightly dip one side of each triangle into seasoning mix, coating evenly. Place triangles on work surface, seasoning side down. Place 1 baked fish stick on shortest side of each triangle. Top each fish stick with 2 strips of cheese and about 1 teaspoon salsa. 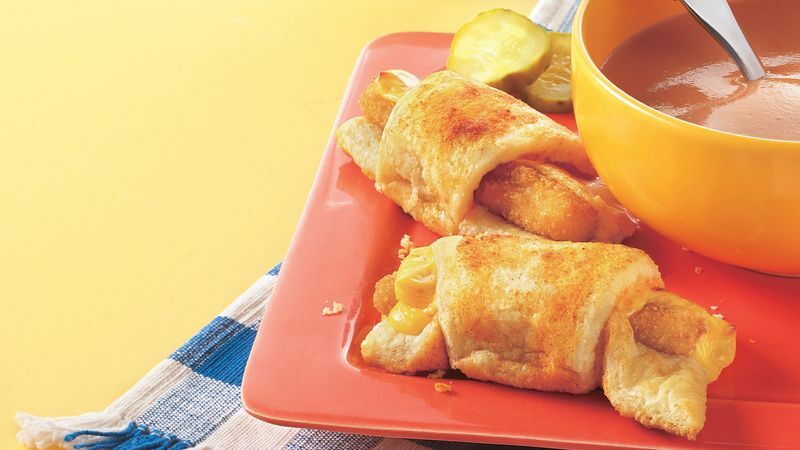 Starting with shortest side of each triangle, roll up dough around fish stick; place cheese-side-up in same pan. Return to oven; bake 12 to 15 minutes longer or until golden brown.